Before the settlers organized their cooperative store, and during the time they were just beginning to experiment with self-help, pressures from the state and federal government were escalating. "A meeting of the executive board of the Noxon temporary Red Cross society was held Saturday evening in Peek's hall to complete a permanent organization and elect its officers. The chairman, Mrs. Elizabeth E. Buck, gave a talk on the work done by the temporary organization and then outlined the work to be done by the permanent organization." The temporary organization was formed four months earlier, on October 18, 1917, with 14 members and $14 in the treasury. In those four months membership increased to 125. Total amount of the funds collected during that time, $355.92, the largest single donation received was $10 from B. B. Bunn, owner of a sawmill on Pilgrim Creek. Annual dues netted $121; miscellaneous income from various community fund raising activities provided $234.92. After spending $251.09, a balance of $104.83 remained in Noxon's Red Cross treasury. Officers of the temporary organization were re-elected to continue their work. Mrs. Elizabeth E. Buck, Chairman, Mary Divers, Vice-chairman, Maude E. Larson, Secretary, Florence 'Fanny' Hampton, Treasurer, and Enid Phillips formed the executive committee. "The hard time ball given by the Noxon branch of the Red Cross Saturday evening was a decided success, both socially and financially," the editor told readers. "The fines imposed on those whose dress did not answer the requirements of the women police appointed for the occasion afforded considerable amusement and netted $63. The total proceeds of the evening were $108.61, which included membership fees and donations." "More than $200 was cleared for the Red Cross at the dance, basket social and auction sale Saturday evening, and a large crowd which included people from Heron, Trout Creek and other points enjoyed a very pleasant social time. Rollo Older of Trout Creek, acted as auctioneer and sold 48 baskets for $158. A crocheted scarf donated by Mrs. Ruby Anderson was raffled off to B. B. Bunn, bringing $20, and other donations, consisting of canned fruit, crocheted articles, handkerchiefs and one fine Plymouth Rock hen given by Mr. Matheny, were auctioned off." People in the community continued to support the Red Cross, mainly through social gatherings the ladies arranged. Cloth, another item the nation at war called for, was turned into yet more ways to have fun. "After the Community meeting Saturday evening, February 16, a rag dance will be held at Peek's hall. It is given under the auspices of Chas. H. Smith. One of the unique features of the dance will be the requirement of admission for the ladies. Each lady who enters will be asked to present a rag at least two feet square. At midnight, the Red Cross ladies will serve one of their usual good suppers. A good time is assured all who come." Chas. Smith played piano, accompanied by a drummer who came from Plains, Montana, whose name is lost to history. 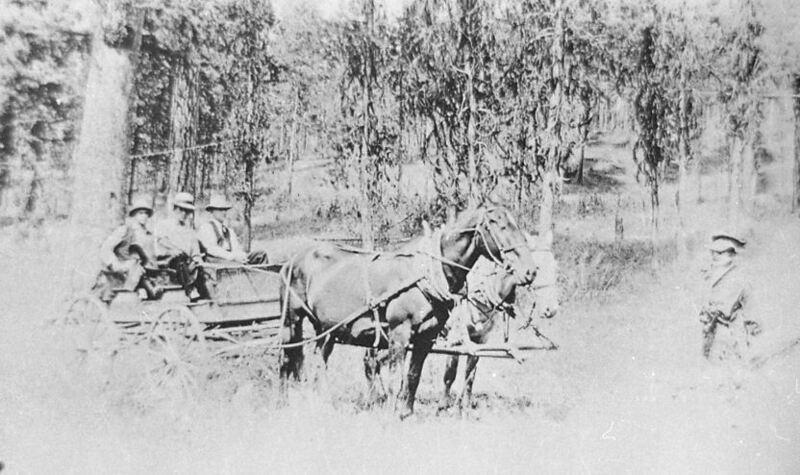 A group of foresters on the way to town from Thompson Falls Ranger Station. Circa 1912. Note the 'dolled up' stump. Courtesy Granville and Pauline Gordon collection. Controversial solicitings and organizations drove more wedges in the community. A call was made on the pocketbooks of the home front when "The Boys in France" tobacco fund was devised. To refuse to support the community efforts to raise funds for it could also be construed as pro-Germanism. Whether you believe in smoking or not was immaterial.1. Early in 1917, Governor Samuel V. Stewart created the Montana Council of Defense. It ran for almost a year as a quasi-legal body before the Extraordinary Session of the 15th Legislature made the council a legal state agency. ORDER No. 1. No parade or public demonstration will be held without the permission of the Governor. ORDER No. 3. The German language will not be permitted in any Montana schools for churches; specified books (and other books deemed pro-German) will be removed from libraries. ORDER No. 6. County Councils will created and enforce herd districts. ORDER No. 7. The State Council will investigate and hear all matters involving "public safety," exercising subpoena power and the power to enforce its decisions. ORDER No. 9. All burning will be prohibited during the months of June, July, August and September. ORDER No. 10. During August, September and October, businessmen will make only one delivery each day, thereby freeing their employees for harvest work on local farms. ORDER No. 12. No new newspapers will be created in the state; weekly newspaper will be prohibited from publishing more than once per week. ORDER No. 17. No dance or benefit will be held without the permission of the County Council of Defense.3. The State Council engaged John G. Brown to act in the capacity of a special prosecutor to prosecute any violations of the council's order. Henry Larson, living with his parents in Thompson Falls, but oftimes clerking for Dr. Peek in his store at Noxon, was named chairman of Noxon's council on the County Council of Defense in March, 1918.4. The editor of the The Sanders County Independent Ledger performed a distinct service for his readers by reporting the following information, when in May, no one from Noxon attended when a county defense society was formed in a meeting held in Thompson Falls. "decided that the applications for membership should be passed on by a committee appointed by the executive committee. The proceedings of this committee are to be kept secret, as are the names of the ones who compose it. "The records of all those who desire to affiliate with the society will be investigated by this committee and if shown to be 100 percent American, the application will be accepted; if there is any evidence of pro-German, anti-American or peace-at-any-price sentiment, the person will not be eligible for membership. "The object of the society is to promote every project that tends toward hastening victory for the United States and its allies, the protection of every patriot's liberty, and the suppression of all pro-German and seditious propaganda, or anything else that ends toward impairing American war activities."5. Noxon men went instead to the homestead of Mrs. T. J. Denson. Saws, axes, and fires were the tools of a clearing bee, which cleared about three acres of land. Caption: Square dancers at the platform built of rough lumber on the Patrick Duffy ranch. Circa July 4th celebration 1920. Elizabeth Larson Weber is eating an ice cream. Courtesy Ruth Dettwiler McQuaide collection. Effects of World War I on the community grew weekly. Patriotic fever allowed imposition of increasing majority rule – in aspects of life styles never before tampered with. Aliens were ordered to register and be classified as alien enemies.6. Women, including American-born women who were married to aliens, all males 14 years and older, and even those who had declared an intention to become citizen by taking out first papers of naturalization, were ordered to register for classification. Some Noxon settlers were included. Later it would cause great hardships.7. By fall the government was asking every household to save and send in their pits from peaches, apricots, cherries, plums, olives, prunes and dates, and the shells of Brazil nuts, hickory nuts, walnuts and butternuts to be forwarded to the manufacturers of gas masks for the protection of our soldiers from poison gas being used in European campaigns.8. Aside from whatever bickering and jealousies that arose over patriotisms and politics, generosity ran high. Montana was the top state in contributing war work funds to the YU.M.C.A. in "the amount subscribed in proportion to the population." The quota was $90,000 and people subscribed $167,068.33. Sanders County contributed equally to the rest of the state.9. Montanans were equally generous with sending their sons off to the war, and the weekly newspaper proclaimed their services. "The records of the Adjutant General's office to February 1st show that Montana has given 5,460 men to the regular army since last April on a quota of only 752. These are voluntary enlistments and do not include the thousands that are in the national army, national guard, navy or marines. In this respect, Montana leads all of the states of the nation in proportion to its population." Caption: 4th of July, circa 1920. One of the many lively square dances held on a platform in the woods near Heron, Montana. At right are Mary and Harry Harker. A platform was built of rough-cut lumber in the area of the Patrick Duffy place. Courtesy Ruth Dettwiler McQuaide collection. Sanders County Independent Ledger, Janaury 31, 1918. Sanders County Independent Ledger, May 2, 1918. Montana Magazine, Nov-Dec. 1990 and Sanders County Independent Ledger, var., 1918. Sanders County Independent Ledger, March 21, 1918. Sanders County Independent Ledger, May 23, 1918. Sanders County Independent Ledger, January 24, 1918. Sanders County Independent Ledger, October 24, 1918. Sanders County Independent Ledger, February 14, 1918. Sanders County Independent Ledger, February 21, 1918.